March is rolling right along, and a total of 82 teams are getting ready for the trip to Huntsville. We heard this week from a couple of competitors, who updated us on their buggy-building efforts. The teams are really pumped and ready to go! The Lima Senior Moonbuggy Teams have been hard at work completing the build of the buggies. 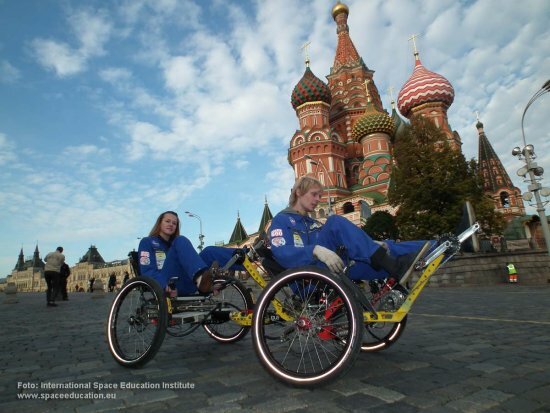 Since first competing in the NASA Great Moonbuggy Race in 2007, the Lima Senior Spartans have learned many strategies for coping with the difficulties that we will inevitably face. Both moonbuggy teams are working hard to finish and test the buggies, and the marketing and public relations teams are working diligently to complete the final tasks necessary to travel to Alabama. We will be updating our social media accounts regularly from now until after the race. Follow @LSHMoonbuggy on Twitter, or find the Lima Senior High School Moonbuggy Team on Facebook. 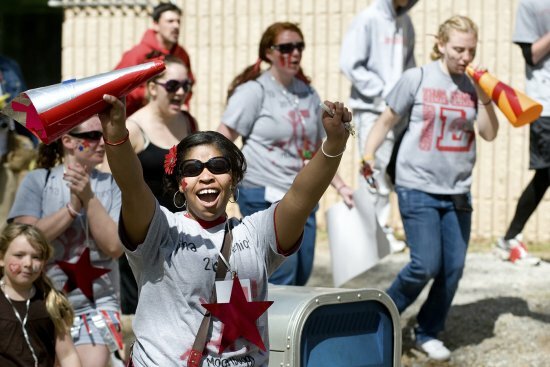 Editor’s Note: We don’t call them “Loud Lima” for nothing — every year, a huge contingent of Lima supporters road-trips to Huntsville to root for their team. We look forward to seeing (and hearing) them again this year! If, in the future, we want to settle the moon and the planets as we live in orbit right now, we’ll need to be willing to swap nationality against an “Earth citizenship” Exploring space is the task of humanity as a whole. It may be pioneered by several nations at first, but at the end of the day we’ll all have to be prepared to work together smoothly to discover the new. Great achievements are only possible in a team, with impeccable excellence and consideration for safety above all. These are the core values of NASA and the house rules of the International Space Education Institute. And I love them — thank you, America! Last year, we scored the best time in the NASA Great Moonbuggy Race. For a long while afterward, we didn’t really realize what that meant. The success was such a surprise that each of our team was unprepared. After all, it’s only 1 second of a difference — not more, and not less. But it was pivotal. And the moonbuggy by the team of Fajardo Vocational High School in Puerto Rico and ours couldn’t be more different. That single second showed that many ways lead to success. Thank you, Puerto Rico, for this experience! For the first time, a foreign team took the title. Was that a little Sputnik-style shock? Then again, why not? We never understood the Moonbuggy Race to be a one-off event, but a never-ending journey. Still, we were conscious of having roused your enthusiasm, and that made us proud. We know that there is only one goal for each of you: to be better. All the team members from Germany are keeping this in mind too. Since our first international participation five years ago, it’s become increasingly vital for us also to inspire other nations for the Moonbuggy Race. The Moonbuggy has a great future if it goes multinational. Our nations — the United States, Germany, Russia — have a common historic core. This is where space exploration began. German engineers were also working in Russia on the rockets for Sputnik and Gagarin, like the von Braun team in Huntsville. It is therefore with great pleasure that we present two Russian teams in 2011, this special year. One team is driving under our support. Another, from the Moscow Aviation University, initially trained with us, and now want to be in competition. We’re really excited. Just like in America, Russia is celebrating 40 Years of the Lunar Rover. Lunokhod 1 was an automatic rover that landed on the moon a bit earlier than NASA’s Lunar Roving Vehicle. Lunokhod 1 took 20,000 photographs, 200 films and covered some 7 miles on the moon. In addition, April 12 is a double anniversary: Thirty years of the Space Shuttle program and 50 years since Yuri Gagarin’s first flight to space. Both are firsts, ground-breaking achievements. They’re based on excellence, integrity and team spirit. I’m convinced this is what you’ll all be bringing to the race. Editor’s Note: Our appreciation to Regina Peldszus of Kingston University in London for translating Ralf’s material. Good luck to all the teams this year! Hope everyone acheives their goals! Previous Previous post: Let&apos;s Roll!